& with the formation of A and B sections at Liverpool (Sydney) camp on the 16th March 1915, under the command of Lt.Col. R.E.Roth, D.S.O. V.D. The Unit then moved to Queens Park, Waverley (Sydney) where all branches of training was carried out. (It had been intended to form C section of Tasmanian troops, but eventually a complete NSW Unit was formed. On the 12th of May 1915, one Officer and thirteen O.R.s (other ranks) left for EGYPT on board the S.S. THERMOSTICLES. The Ambulance Transport Sub Divisions and part of C section departed Sydney on the 31st May 1915 on board the SS AJANA. The MAIN BODY of the Field Ambulance departed on the 25th June 1915 on board the SS CERAMIC. A mishap occurred with the SS AJANA in that due to the extreme heat in the Red Sea, the ship berthed at BOMBAY to give the horses a spell but on entering the docks it struck the lock gate and buckled her bow. This gave the all the troops aboard a week in BOMBAY whilst repairs were carried out. Proceeding to SUEZ, the troops etc then were railed to HELIOPOLIS, where they went into camp where they were rejoined by the main body (who had crossed without incident). The unit, after training and equipping, departed for GALLIPOLI (minus its transport element) and arrived at ANZAC COVE, before daylight, on the 22nd August 1915. 8 Officers and 198 O.R.s disembarked in the early hours of the morning with the last party reaching the shore just after daybreak. For the remainder of the day, the unit rested in RESERVE GULLY. At 7.30pm, it left for HILLS POINT and the first real field work was done by the section of stretcher bearers who were called on to assist in carrying wounded from HILL 60. On the following day (23rd), the Field Ambulance set up its first Dressing Station by establishing an Aid Post at WALDRONS POINT-this was the FIRST ambulance post to be set up by an Australian Division. From 7pm on the 23rd till 4am the next morning, 307 casualties passed through the Aid Post. This consisted of a small operating tent where 6 Medical Officers and staff were working continuously. The stretcher-bearers had to carry patients approx. 3 miles. The 5th Fd Amb suffered its own first casualty when Pte. W. Ramage was killed while collecting wounded, with other volunteers, in no mans land. On the 7th of September, B section moved to POPES POST while A and C sections went to REST GULLY;. Later, B section moved to MULE GULLY. About the 12th of December, preparations commenced for the EVACUATION of GALLIPOLI and 36 volunteers were called for, to remain with the battalions to assist with any wounded at the last minute--every MAN in the unit VOLUNTEERED to stay behind. Many felt a keen disappointment at having to depart with the main body on the 15th of December. It is interesting to note that from the 23rd of August to 31st of November 1915, 2,934 patients were attended to and of these, 969, later rejoined their units for duty. After leaving GALLIPOLI, the 5th spent a few days at LEMNOS and celebrated its first CHRISTMAS. After leaving LEMNOS, they reached ALEXANDRIA on the 8th January 1916. They traveled by train to TEL-EL-KABIR, where the transport sub-divisions rejoined. From here the complete unit left for FERRY POST on the SUEZ CANAL. While they were here, C section was sent to form part of the 15th Australian Field Ambulance and the remainder left MOASCAR for FRANCE on the 17th March 1916, aboard S.S.ARCADIAN and arrived without mishap at MARSEILLES on the 22nd March. The following night the unit left by train for Northern FRANCE. The impressions of this 3-days journey will never be forgotten as the troops witnessed smiling faces, waving handkerchiefs and blowing kisses from every farmhouse and village and railway station they passed through. Gifts of flowers and fruit were pressed on them. The destination was a small French village about 25 miles from the front line. In the distance could be seen the flashes from the guns and flares and the reports of the shell explosions would float back to our lines. Lord KITCHENER and General JOFFRE reviewed the Australian troops a few days before they took their place in the firing line. The area was a quiet one and no heavy action took place. On the 1st of July, the unit moved to the SOMME to take part in the great offensive. Here the Australians confirmed their reputation by the capture of POZIERES RIDGE and village. The 5th, during that time, was in charge of the evacuation of a Divisional front and ALL patients passed through their HQ at BECOURT CHATEAU. After a very strenuous week, the unit moved back to CANAPLES where recuperation and reorganisation took place. Here a new C section was formed and the unit was brought back to its former strength. On the 29th August the unit was back in the line. The great battle was still raging and the unit worked with stretcher bearers from other Field Ambulances on a line of evacuation running through the place where POZIERES had once been, out to MOUQUET FARM. After a week or so, the unit left for VARDENCOURT and from there took over part of the line in the YPRES sector. A fairly quiet month was spent here before we were sent back to the SOMME for the winter. Our HQ was located at BECORDEL whilst our stretcher bearers worked in the FLERS, MONTAUBAN and DELVILLE WOOD sectors. Our second Christmas was spent here and a very muddy Christmas it was! After a rest at RIBERMONT, our HQ took over the post in the German-made dug-outs under the remains of the famous CONTALMAISON CHATEAU. Our Advanced Dressing Station was at MARTINPUICH. We were here when the evacuation of BAPAUME took place and on the first signs of this an Advance post was placed at LE SARS on the BAPAUME ROAD. A number of stretcher squads from our unit formed part of the pursuing column, whose work was to keep in close touch with the enemy. The next action for our unit was the famous BULLECOURT battle. It was here that the Australians broke the HINDENBURG LINE. The stretcher-bearers of ALL the ambulances engaged earned special praise for their magnificent work under constant observation and enemy shellfire. Unfortunately, more casualties were suffered here than in any previous action. After BULLECOURT, the Australians received a well earned rest and during May, June and July, excellent weather favoured the various forms of sport and training which took place. Later, the unit moved to the ST OMER district and further training took place. It was here that the 2nd Division was reviewed by General Sir Douglas HAIG on the 29th August 1917. The C.O. of our unit, 19 months prior to this, was Lt.Col.J.H.PHIPPS, D.S.O. and now his place was taken by Lt.Col.J.J.NICHOLAS. We were then back in action in the great battles for PASSCHENDAELE and our unit shared in this work, which earned unstinted praise from all quarters. The ambulance arrangements for the attack were supervised by Lt.Col.Nicholas who was killed on the first day of the attack. Our Advanced Dressing Station was on the MENIN ROAD and the stretcher bearers had strenuous work to do in conjunction with the advancing infantry. One DSO, one DCM, one MM and Bar and 37 MMs. The unit was disbanded in 1919 and re-raised as a MILITIA unit in 1921, together with the 14th Field Ambulance. Their Training Depot was at Addison Road, MARRICKVILLE (Sydney). Each unit had a large number of men from the NSW Tramway and Omnibus First Aid. They mainly came from the NEWTOWN and WAVERLEY Tram Depots. When WW 2 was declared in September 1939 the unit had camps at WALLGROVE (Sydney) and GRETA (northern NSW) and WW 1 horse drawn ambulances were used to train recruits as there were no motor ambulances at that time. Later, a large camp was set up at BATHURST (NSW). It seems that the unit formed a CAMP DRESSING STATION, which was disbanded and then became 2 CAMP HOSPITAL (and later, 2 MILITARY HOSPITAL, INGLEBURN). I cant find any real information on what actually happened to 5th Field Ambulance (the Militia unit) from 1921 to 1940. The 2/5th Field Ambulance was formed in Victoria, in May 1940, at PUCKAPUNYAL and was disbanded in BALIKPAPAN (BORNEO) in October 1945. The 2/5th left Puckapunyal on the 20th October 1940 to board the R.M.S. MAURETANIA, a 38,000 ton luxury liner. Our ship sailed out of Port Philip bay and joined a large convoy to BOMBAY. We landed on the 4th November and departed, in smaller ships, on the 12th (we celebrated ARMISTICE DAY (11th) in BOMBAY. We entered the SUEZ CANAL on the 24th November 1940 aboard the HMT DILWARA and disembarked at EL KANTARA and then by train to PALESTINE. We arrived at CAMP 6, JULIS about 8pm and found to our delight that the 2/1st Pioneers had set up all the tents--this was very welcome after a long, hot day. We spent our first Christmas at JULIS. The 4th January 1941 was a marked occasion for us. We moved out of JULIS to IKINGI MARIUT in EGYPT and as such were transferred from 21st Brigade in 7th Division to 18th Brigade in 6th Division. The 2/5th saw service in CYRENAICA and EGYPT, we were in the SIEGE of TOBRUK (from early May until late August 1941) and SYRIA. When PEARL HARBOUR was bombed in December 1941 by the Japanese, events took an ominous turn and we were shipped out of the MIDDLE EAST in a movement code-named STEPSISTER which involved a number of ship movements with troops, stores and equipment. We departed on the 11th February 1941 on board the M.V. NIEUW AMSTERDAM and arrived in BOMBAY on the 22nd and were disembarked to be broken up and put into smaller vessels-TAKLIWA; DILWARA, NEVASA, CLYDEBANK and TAI. At this time, the Japanese had captured SINGAPORE and PALEMBANG and there was grave concern for the safety of Australia. The convoy stopped and refueled in COLOMBO and eventually reached PORT ADELAIDE on the 27th March 1942. Once in Australia, 2/5th went into intensive training for the important move to MILNE BAY. We moved in to MILNE BAY on the 17th of August 1942 until, on the 9th of March 1943, we boarded the M.V. KARSIK with all gear and equipment and landed in TOWNSVILLE on the 12th of March. We entrained for ATHERTON TABLELANDS and arrived at RAVENSHOE on the 14th March.There was intense training after 5 weeks home leave. In early June we were training in river crossing methods. Eventually, we entrained at OONOONBA to TOWNSVILLE and boarded HMT KATOOMBA, also on the 17th August 1943 (one year later). The advance party of the 2/5th arrived in PORT MORESBY 15th August 1942. Our main body arrived in PORT MORESBY on the 20th August 1942 and were fostered by the 2/6th Fd.Amb. Early in January 1944, we were flown (for the first time) to DUMPU in the RAMU VALLEY. We took over the Medical Dressing Station from the 2/4th Fd.Amb. The SHAGGY RIDGE area was probably the worst terrain in which we were ever called on to work. Eventually, orders were received to move out on the 15th May 1944. We were flown to LAE and boarded HMT DUNTROON for TOWNSVILLE, berthing on the 20th. After leave and more exercises it was Christmas 1944. The first one spent in Australia since 1940. We sailed on the 21st of May 1945 eventually reaching MOROTAI on the 12th of June. A massive convoy was assembling for the attack on BORNEO. The BALIKPAPAN capture was all but over by July 1945. Then word came through of the dropping of the Atomic Bomb on HIROSHIMA and NAGASAKI and finally the Emperor of Japan signed the unconditional surrender on the 15th August 1945. Our unit was disbanded on the 13 October 1945. We served in EGYPT, SYRIA and NEW GUINEA. Our unit was awarded One DCM, One MBE, One MM and Four MIDs. 5th Field Ambulance was again raised as a C.M.F. unit in 1948 and in 1951, after the first National Service Intake from 19 NS Battalion at HOLSWORTHY (NSW), the unit eventually came back to full strength of over 250 Officers and soldiers. 1st Field Dressing Station was raised in 1951 with personnel from the 5th Fd.Amb. as was 1 General Hospital. The last parade of 5th Field Ambulance was held on the 9th March 1976 with the C.O. Lt.Col.P.J. (Jim) McGrath (dec.) in command. This was the result of the Millar Report. The unit was again re-raised on the 6th February 1989 and was based at Carlow Street, CROWS NEST (Sydney) and commanded by Lt.Col. Derek Cannon. Due to reorganisation within the army, the unit became part of 5 BASB (Base Administrative Supply Battalion) in 1995. In 2000 it has now been re-named 5 CSSB (Combat Service Support Battalion) with the medical component now known as HEALTH COMPANY. The current C.O. of 5 CSSB is Lt.Col. Ian Mondon and the O.C. of the Health Company is Major Brian Malouf. Book One Mans Story--an Autobiography by Keith Jones. 2/5th Field Ambulance A.I.F. Unit History by Lloyd Tann. We credit the late Jim McGrath and the late Kevin Findlay for starting our Association in 1982. 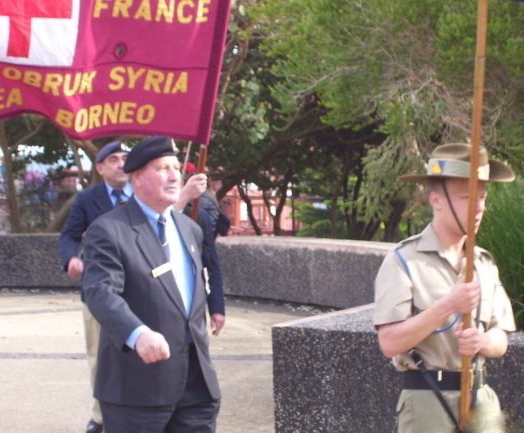 We have been affiliated with the RSL of Australia (NSW Branch) since that time. NB: I am at a loss to fill in the gap between 1921 (when the unit disbanded) and 1940 (before the 2/5th was formed.) I need help!